OVER DECADES, THE CIA AND THE US MILITARY HAVE CREATED AND DISSEMINATED MANUALS TO TEACH THE ARMIES OF MANY COUNTRIES HOW TO INFILTRATE AND SPY ON CIVILIAN GROUPS, FORCIBLY EXTRACT INFORMATION, SUBVERT DEMOCRACY, AND TARGET NOT ONLY INSURGENCY BUT ALSO LEGAL AND PEACEFUL LABOR UNIONS, STUDENT GROUPS, AND RELIGIOUS AND CIVIC ORGANIZATIONS. THE PAPER TRAIL--WHICH BEGINS WITH THE MYSTERIOUS PROJECT X IN THE 1960S AND LEADS THROUGH THE CLASSROOMS OF THE US ARMY SCHOOL OF THE AMERICAS IN THE 1980S--REVEALS A CONSISTENT POLICY IN WHICH THE END JUSTIFIES ANY MEANS. 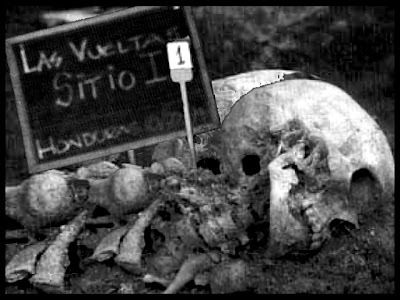 A marker notes one of five skeletons exhumed from a mass grave in an attempt to solve crimes committed by the US-trained Honduran Battalion 316. Several recently declassified US military training manuals show how US agents taught repressive techniques and promoted the violation of human rights throughout Latin America and around the globe. The manuals provide the paper trail that proves how the US trained Latin American and other militaries to infiltrate and spy upon civilians and groups, including unions, political parties, and student and charitable organizations; to treat legal political opposition like armed insurgencies; and to circumvent laws on due process, arrest, and detention. In these how-to guides, the US advocates tactics such as executing guerrillas, blackmail, false imprisonment, physical abuse, using truth serum to obtain information, and paying bounties for enemy dead. Counterintelligence agents are advised that one of their functions is "recommending targets for neutralization," a euphemism for execution or destruction. On September 20, 1996, the Pentagon released seven training manuals prepared by the US military and used between 1987 and 1991 for intelligence training courses in Latin America and at the US Army School of the Americas (SOA), where the US trains Latin American militaries. The Bush administration withdrew the manuals in 1991 because of belated concerns about their content and conducted an internal investigation. The manuals, however, were kept under wraps. The Pentagon press release accompanying a selection of excerpts from the manuals downplayed their significance, citing the conclusions of the 1991-92 investigation that "two dozen short passages in six of the manuals, which total 1,169 pages, contained material that either was not or could be interpreted not to be consistent with US policy." The SOA also played a damage control game, describing the manuals as merely containing several passages with "words or phrases inconsistent with US government policy." The problem with the seven Army manuals, however, is not a few stray words but a deeply anti-democratic framework. Moreover, they were not the only ones. In a separate quest for information on US connections to the training of Honduran Battalion 316 that disappeared some 200 people in the 1980s, the Baltimore Sun had filed a Freedom of Information Act (FOIA) request for US training manuals used in Honduras. In January 1997, right after the Baltimore Sun threatened to sue over lack of response to its FOIA request, the US government released two CIA manuals that contained even more heinous material than the seven Army manuals. Then, on March 6, the Washington Post ran a story revealing that the seven Army manuals had even deeper roots. They were based on an older set of training materials known as "Project X," written by US Army experts starting in 1965. The Joint Foreign Intelligence Assistance Program used Project X to train US allies in Vietnam, Iran, Latin America, and other parts of the developing world. With this parentage established, it became irrefutable that the seven Army manuals were not an aberration. Rather, they were but one part of a consistent lending library on repressive techniques used by the United States to train foreign militaries. Prepared by the US military and used between 1987 and 1991 for intelligence training courses in Latin America and at the SOA, the seven texts drew from lesson plans school instructors had been using since 1982 and incorporated material going back to the 1960s. The manuals directly contradict the often issued official excuse that SOA graduates who perpetrated many of the worst massacres of the hemisphere were "a few bad apples" who did not reflect school teachings or US policy. They were released as the result of extensive public and congressional pressure. The first official mention came in the president's advisory Intelligence Oversight Board's June 1996 report on Guatemala, which was made public in response to the high level of pressure from human rights and grassroots organizations. Rep. Joseph Kennedy (D-Mass. ), interested because of his championship of a bill to close the SOA, then asked the administration to declassify the manuals in their entirety. The manuals' discovery has helped reinvigorate grassroots, religious, and congressional efforts to close the US Army School of the Americas. It proves on paper what so many have said for so long that US training contributed to the devastating human rights violations in the region. Although Latin American militaries were perfectly capable of violating human rights and democratic principles without US sponsorship, the anti-democratic training methods advocated by the US provided at the very least a green light for repression. And for decades, the traffic was heavy. Techniques of control contained in the manuals were actively adopted by Latin American militaries, particularly in the 1970s and 1980s; in Chile's and Argentina's "dirty wars" in which thousands of dissidents disappeared; by military dictatorships in Brazil, Paraguay, and Uruguay; in the Central American wars, where tens of thousands of civilians were killed; and in the Andean countries, where human rights violations still abound. In most cases, the militaries being trained not only suppressed armed rebellion but also repressed democratic, civic opposition. militaries. The instructor asked to develop the course, Capt. Vic Tise, turned to Project X materials, stored at Fort Huachuca, Arizona, and updated them into lesson plans. In 1987, the 470th Military Intelligence Brigade took the SOA lesson plans and turned them into textbooks: Handling of Sources, Guerillas and Communist Ideology, Counter- intelligence, Revolutionary War, Terrorism and the Urban Guerilla, Interrogation, Combat Intelligence, and Analysis I. These manuals were then used by US trainers in Latin America and distributed to Latin American intelligence schools in Colombia, Ecuador, El Salvador,and Peru. They came full circle back to the SOA in 1989 when they were reintroduced as reading materials in military intelligence courses attended by students from Bolivia, Colombia, Costa Rica, the Dominican Republic, Ecuador, Guatemala, Honduras, Mexico, Peru,and Venezuela. The US government estimates that as many as 1,000 copies may have been distributed at the SOA and throughout Latin America. From start to finish, six of the seven Army manuals are how-to-guides on repressive techniques. Throughout their 1,100 plus pages, there are few mentions of democracy, human rights, or the rule of law. Instead, there are detailed techniques for infiltrating social movements,interrogating suspects, surveillance, maintaining military secrecy, recruiting and retaining spies, and controlling the population. While the excerpts released by the Pentagon to the press are a useful and not misleading selection of the most egregious passages the ones most clearly advocating torture, execution, and blackmail they do not reveal the manuals' highly objectionable framework. In the name of defending democracy, the manuals advocate profoundly undemocratic methods. Just as objectionable as the methods they advocate is the fundamental disregard for the differences between armed insurgencies and lawful political and civic opposition an attitude that led to the deaths of hundreds of thousands of Latin American civilians. OPPOSITION REVOLUTION - The Counterintelligence manual, for example, defines as potential counterintelligence targets "local or national political party teams, or parties that have goals, beliefs or ideologies contrary or in opposition to the National Government," or "teams or hostile organizations whose objective is to create dissension or cause restlessness among the civilian population in the area of operations." This text recommends that the army create a "blacklist" of "persons whose capture and detention are of foremost importance to the armed forces." It should include not only "enemy agents" but also "subversive persons," "political leaders known or suspected as hostile toward the Armed Forces or the political interests of the National Government," and "collaborators and sympathizers of the enemy," known or suspect. Throughout, the manuals highlight refugees and displaced persons as possible subversives to be monitored. They describe universities as breeding grounds for terrorists, and identify priests and nuns as terrorists. They advise militaries to infiltrate youth groups, student groups, labor unions, political parties, and community organizations. Even electoral activity is suspect: The insurgents "can resort to subverting the government by means of elections in which the insurgents cause the replacement of an unfriendly government official to one favorable to their cause"; "insurgent activity" can include funding campaigns and participating in political races as candidates. One of the most pernicious passages, in Combat Intelligence, lists ways to identify guerrilla presence. "Indicators of an imminent attack by guerillas" include demonstrations by minority groups, reluctance by civilians including children to associate with US or their local troops, celebrations of national or religious festivals, or the presence of strangers. "Indicators of control by guerillas" over a certain civilian population include the refusal to provide intelligence to government forces or the construction of new houses. Indications that insurgents are conducting psychological operations include accusations of government corruption, circulating petitions, attempts to discredit the government or armed forces, calling government leaders US puppets, urging youth to avoid the draft, demonstrations or strikes, or accusations of police or army brutality. As a helpful hint, this manual recommends drawing maps using different colors to depict the civilian population as "loyal to the government," "ambivalent," "possibly loyal to the insurgents," and "areas controlled by the insurgents." LEGAL AND HUMAN RIGHTS CONSIDERATIONS - The few allusions to legal and human rights considerations appear to have been added after the fact or in a superficial manner. Mention of the Geneva Convention is inserted at the beginning of Interrogation, while Counterintelligence, when dealing with interrogation techniques, repeatedly refers to the rights of the suspect. In most of the manuals, however, discussion of rights is not integrated into the text or is contradicted in other passages. In some cases, human rights conventions are distorted. Readers are taught, for example, that an insurgent "Does not have a legal status as a prisoner of war under the Geneva Convention," implying that there are no international conventions covering humane treatment. In most of the discussions of techniques, however, legal considerations are simply absent. Over and over, the manuals treat detention without noting proper procedures for obtaining admissible evidence or for arresting or bringing suspects to trial. There is no mention of warrants or the right to contact an attorney or of any comparable local laws. Indeed, it is recommended throughout that detainees be kept in isolation, often it is clear from the descriptions in several manuals in clandestine jails. Interrogators are advised to use false names. Few distinctions are made between the treatment of armed guerrillas and civilians. At no time do the manuals state that the person detained or arrested must first be suspected of having committed a crime or even be told the reason for the arrest. The only rationale needed for arrest or detention is that the intelligence agent wants information the detainees may have. A PURELY MILITARY RESPONSE - Civil society and government, too, are often viewed simply as impediments to military control. With no mention of the propriety of the practices, a number of the manuals advocate controlling information through censorship as well as by spying on and infiltrating civilian groups. In general, the population is a source of information at best, an enemy force at worst. The civilian government fares little better; it is one more entity to be reported on or pushed aside. Ways to impose curfews, military checkpoints, house-to-house searches, ID cards, and rationing are presented without reference to laws or the role of the legislature. Indeed, there is little discussion of the proper relationship between a civilian government and military authorities. Much more effort is put into the role of the army in quashing revolutionary tendencies. Several of the manuals teach militaries and intelligence services how insurgencies develop and how to control them. The description of the former is generally simplistic and dated, with few references to the role official repression plays in fueling insurrection. The brief histories of El Salvador and Guatemala, for example, in Terrorism and the Urban Guerilla skip over repression, human rights violations, or problems in democratic governance that contributed to the growth of revolutionary movements. Insurgents are reduced to manipulators of popular discontent, in thrall to Soviet-style Marxism. While Combat Intelligence offers a more sophisticated explanation of the underlying reasons for revolutionary movements such as the strains created by rapid modernization, the existence of corrupt elites and government repression neither this manual nor any other suggests steps a civilian government might take as a political response to popular discontent. There is no limitation on when to use military and counterintelligence methods. FROM BAD TO WORSE: THE CIA MANUALS - The two recently declassified CIA manuals make even more chilling reading. The CIA had written KUBARK Counterintelligence Interrogation in 1963 for use by US agents against perceived Soviet subversion. (KUBARK was the CIA's codename for itself.) While it was not intended to train foreign military services, its successor, Human Resource Exploitation Training Manual 1983, which drew heavily on material in KUBARK, was used in at least seven US training courses conducted in Latin American countries between 1982 and 1987, according to a June 1988 memo placed inside the manual. This 1983 manual originally surfaced in response to a June 1988 congressional hearing which was prompted by allegations by the New York Times that the US had taught Honduran military officers who used torture. The 1988 hearing was not the first time such manuals had surfaced. In 1984, a CIA manual for training the Nicaraguan Contras in psychological operations created a considerable scandal. These two CIA textbooks deal exclusively with interrogation and devote an entire chapter each to "coercive techniques." Human Resource Exploitation recommends surprising suspects in the predawn hours, arresting, blindfolding, and stripping them naked. Suspects should be held incommunicado, it advises, and deprived of normal routines in eating and sleeping. Interrogation rooms should be windowless, soundproof, dark, and without toilets. The manuals do admonish that torture techniques can backfire and that the threat of pain is often more effective than pain itself. However, they then go on to describe coercive techniques "to induce psychological regression in the subject by bringing a superior outside force to bear on his will to resist." These techniques include prolonged constraint, prolonged exertion, extremes of heat, cold, or moisture, deprivation of food or sleep, disrupting routines, solitary confinement, threats of pain, deprivation of sensory stimuli, hypnosis, and use of drugs or placebos. According to the Baltimore Sun, "the methods taught in the 1983 manual and those used by [the US-trained Honduran] Battalion 316 in the early 1980s show unmistakable similarities." The paper cites the case of Ines Murillo, a Honduran prisoner who claimed she was held in secret jails in 1983, given no food or water for days, and kept from sleeping by having water poured on her head every ten minutes. Dismissive of the rule of law, Human Resource Exploitation Training Manual 1983 states the importance of knowing local laws on detention but then notes, "Illegal detention always requires prior [headquarters] approval." The manual also refers to one or two weeks of "practical work" with prisoners as part of the course, suggesting that US trainers may have worked with Latin American militaries in interrogating actual detainees. This reference gives new support to the claims by Latin Americans held as prisoners and by US nun Dianna Ortiz, tortured by the Guatemalan army in 1989, that US personnel were present in interrogation and torture rooms. In 1985, in a superficial attempt to correct the worst of the 1983 manual, a page advising against using coercive techniques was inserted and handwritten changes were haphazardly introduced into the text. For example, "While we do not stress the use of coercive techniques, we do want to make you aware of them and the proper way to use them," has been coyly altered to, "While we deplore the use of coercive techniques, we do want to make you aware of them so that you may avoid them." But the entire chapter on coercive techniques is still included, again with some items crossed out. Throughout, the reader can easily read the original underneath the "corrected" items. These corrections were made in response to the 1984 scandal when the CIA training manual for the Contras hit the headlines. The second manual, KUBARK Counterintelligence Interrogation, is clearly the source of much of the 1983 manual; some passages are lifted verbatim. KUBARK has a similar section on coercive techniques, and includes some even more abhorrent elements, such as two references to the use of electric shock. For example, one passage requires US agents toobtain "prior Head- quar- ters approval ... if bodily harm is to be inflicted," or "if medical, chemical, or electrical methods" are to be used. A third condition for obtaining prior approval is, ominously, whited out. MUCH SPIN, LITTLE OVERSIGHT - Various administrations have tried to smooth the waters of public outrage when training manuals were discovered the Nicaraguan Contra and Honduras manuals in the 1980s, now the Army and CIA manuals with a combination of spin control and cosmetic change. In late 1991, under the Bush administration, the Office of the Assistant to the Secretary of Defense for Intelligence Oversight launched an investigation into the seven Army manuals. The resulting report to the congressional intelligence committees concluded that the manuals' authors and SOA instructors "erroneously assumed that the manuals, as well as the lesson plans, represented approved doctrine." When interviewed by the investigators, the manuals' authors claimed that they believed intelligence oversight regulations applied only to Americans and not to the training of foreign personnel in other words, that US instructors could teach abusive techniques to foreign militaries that they could not legally perform themselves. The Bush administration ordered the retrieval and destruction of the manuals, and the US Southern Command advised Latin American governments that the handbooks did not represent official US policy. However, the whole episode was treated as an isolated incident. The individuals responsible for writing and teaching the lesson plans were not disciplined, nor were the authors and instructors who believed teaching human rights violations was consistent with US policy retrained. In 1992, the Office of the Assistant to the Secretary of Defense for Intelligence Oversight did issue recommendations that "the Joint Staff should establish a policy to ensure that intelligence and counterintelligence training for foreign military personnel by Combatant Commands is consistent with US and DoD policy," and that training materials should go through proper channels for approval. However, these recommendations were never enforced. IGNORANCE AS A DEFENSE - While none of the manuals was written or used on the Clinton administration's watch, the administration so far has failed to send a clear message repudiating such training methods and to take decisive action to ensure that such materials are never developed again. On February 21, 1997, the Department of Defense's inspector general completed another investigation. It admitted that in creating and using the seven army manuals "from 1982 through early 1991, many mistakes were made and repeated by numerous and continuously changing personnel in several organizations from Panama to Georgia to Washington, D.C." Without apparent irony, the report concludes that there is no "evidence that a deliberate and orchestrated attempt was made to violate DOD or U.S. Army policies." The report claims that because these numerous US personnel did not know that it was against US policy to train Latin American militaries to use threats or force with prisoners, "neutralize" opponents, hold prisoners in clandestine jails, and infiltrate and spy upon civilian organizations and opposition political parties all techniques described in the manuals no disciplinary action was deemed necessary. The report, which Rep. Kennedy termed a "whitewash" and "hogwash," does not examine any systemic problem that might have led to "numerous and continuously changing personnel" over a ten-year period lacking a working knowledge of human rights. *26 Thus, the report fails to assign either individual or collective responsibility for training Latin American militaries to violate human rights and use profoundly anti-democratic methods. While the report concludes that the lesson plans and manuals somehow escaped oversight and could not be read because they were in Spanish, Rep. Kennedy's own investigation reveals these as mere dog-ate-my-homework excuses. Kennedy's report states that SOA instructors sent their lesson plans to Fort Huachuca and to at least two offices in Washington to be reviewed, although the question of whether they were approved in Washington continues to be disputed. Moreover, the materials were approved for use in English before being translated into Spanish. The report does demonstrate that little was done to implement the recommendations stemming from the 1991 investigation. In three agencies to which they were simply circulated as a memo, there was no record of it having even been received. In three others, it was received but did not result in any increase in oversight of foreign military and intelligence training. However, the report merely calls for the memo to be reissued as a "directive," rather than stimulating a serious discussion within the military and setting up workable oversight mechanisms.